Parkinson’s disease (PD) is a progressive condition in which cells in some parts of the brain are lost at a faster rate than normal. The most typical symptoms of PD, and those that are used to make the diagnosis, are problems with movement, such as tremor that occurs at rest, slowness and stiffness, and difficulties with balance. These symptoms are caused by loss of the specialized brain cells that produce the chemical dopamine. The figure explains how loss of these cells leads to movement problems in PD. Increasingly, we understand that brain regions other than the dopamine-producing cells are also lost at a faster rate than normal in PD, producing symptoms that were not previously recognized. Some of these symptoms can even appear before the movement problems. 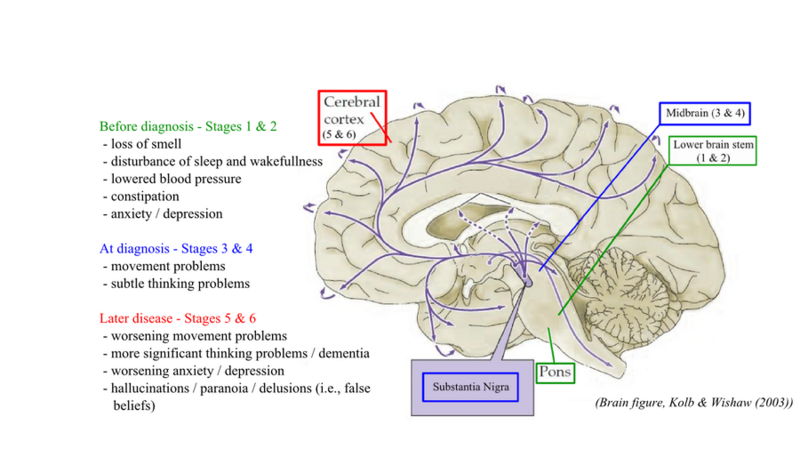 Below is a diagram showing a) the different stages of PD, b) the general brain regions that experience premature cell loss at each stage, and c) the broad categories of symptoms that occur at each stage. The diagram depicts the average order in which brain regions are affected as PD progresses and the symptoms that result. Not all patients develop symptoms in this order. The wide variety of symptoms that can occur in PD is presented in detail later in this handout. PD appears more frequently in people over the age of 50 but on occasion it does develop in younger individuals. Approximately 1-2% of people above age 65 have PD. The cause of PD remains unknown. In about 5% of cases, PD is caused by an abnormality in a single gene and strongly runs in families with many or most family members developing PD symptoms. In the majority of cases, however, having a first degree relative with PD (i.e., mother, father, sister, brother, child) only increases your risk of developing PD slightly (i.e., instead of 1-2% risk, the risk is 3-4%) and therefore other factors, most of which have not yet been identified, are more important than inheritance in determining whether or not you’ll develop PD. Below are symptoms that can occur in PD. Not all patients experience every symptom. The problems with movement, termed motor symptoms, are the cardinal symptoms in PD, and are required to make the diagnosis. Usually, motor symptoms start on one side of the body and only occur on the other side a couple of years later. The symptoms usually remain more severe on the side of the body that was first affected throughout the disease. 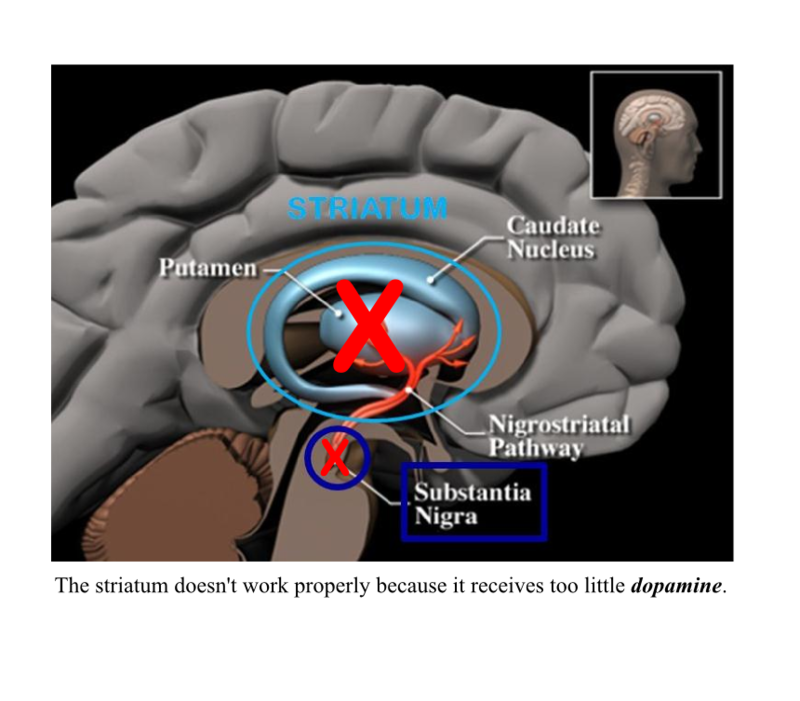 Motor symptoms in PD are produced by too little dopamine in the striatum, as explained above. These symptoms are significantly improved by medications that replace dopamine or that act like dopamine in the brain. Non-motor symptoms are increasingly recognized in PD. Because many of these symptoms also occur in normal aging or in other neurological diseases, it’s not possible to make a diagnosis of PD based on these symptoms alone. Most of these non-motor symptoms, listed below, do not result from a lack of dopamine and therefore do not improve with medications that replace dopamine or that act like dopamine in the brain. Other medications are given to address non-motor symptoms. Unfortunately, therapies available to treat non-motor symptoms are less effective than the medications available to treat the motor symptoms in PD. Note: Essential tremor is a very prevalent form of tremor disorder and hence some patients with PD also have this common condition. An essential tremor is more prominent when muscles are contracted and a posture is assumed (as opposed to the rest tremor that occurs in PD). Essential tremor worsens even further when actions, especially those that require fine control such as writing, eating, or threading a needle, are performed. This tremor will not improve with medications given for PD. Therefore patients with PD and essential tremor need to take different sorts of medications to treat their two separate tremors. Sometimes when a tremor does not seem to be responding to PD medication, it is important to evaluate when the tremor is most prominent in case medications for essential tremor are also needed. Note: Autonomic dysfunction is very common and can begin early and worsen with disease progression. Occasionally PD patients have low blood pressure when standing and very high blood pressure when lying. This can make it difficult to find the right treatment for blood pressure. Note: Cognitive symptoms don’t occur in all patients, or can be very subtle. They tend to worsen with disease progression. What are the treatments for Parkinson’s disease? Currently, there is no cure for PD and there are no treatments that have been shown to clearly stop or slow the progression of PD. Below is a list of treatments available for motor and non-motor symptoms of PD. The generic name of the medication is presented first and the trade name(s) is/are capitalized and listed second. A brief outline of how the medication works and a list of common side effects is written for some. This list is not comprehensive. Idiosyncratic reactions are always possible so discuss any new symptoms that arise after starting a new medication with a physician. rarely, can cause compulsive behaviours such as gambling, shopping, hypersexuality, pre-occupation with video games, collecting items, etc. low blood pressure, especially with changes from lying to sitting or sitting to standing termed orthostatic hypotension – more significant than with L-Dopa – causes feelings of lightheadedness or faintness, and in some cases patients actually “pass out” or lose consciousness. occasionally (more often than with L-Dopa) can cause compulsive behaviours such as gambling, shopping, hypersexuality, pre-occupation with video games, collecting items, etc. Note: Stalevo is a medication that combines levocarb/Sinemet + entacapone/Comtan in one pill. The medication tolcapone/Tasmar is not used because it is has been shown to cause liver damage in some patients. If foods/beverages/dietary supplements rich in the amino acid tyramine (e.g. certain cheeses, wines, fermented food & beverages, decongestant medications, some prescription pain medications) are taken along with these medications, an episode in which the heart rate and blood pressure increases dramatically, called a hypertensive crisis, could theoretically occur. These reactions have not been observed in the clinical trials for this medication so far. Nonetheless these foods/beverages/dietary supplements should be avoided while taking this medication. an antiviral medication that has been shown to slightly improve the symptoms of PD but also has been shown to decrease dyskinesias (i.e., excess movements) that are caused by dopamine precursor and dopamine agonist medications. other antipsychotics that are effective for these symptoms (e.g., risperidone/Risperdal, olanzapine/Zyprexa) worsen PD movement symptoms and therefore should be avoided if possible. Deep brain stimulation (DBS) is an option for PD patients whose motor symptoms do not respond adequately to medication. It is a surgical procedure in which electrodes are implanted in the brain to provide electrical stimulation to the parts of the brain that control movement. The battery pack or neurostimulator that powers the electrodes is implanted under the skin near the collar bone. It is an effective procedure that can greatly improve symptoms such as tremor, rigidity, slowed movement, and walking problems. Because DBS often leads to less need for medication, patients experience less of the associated side effects. It is an invasive neurosurgical procedure, however, with the usual risks of brain surgery such as bleeding, brain injury, and infection and so should only be considered in select cases. What to expect as Parkinson’s disease evolves? Every patient is unique and the number, rate of progression, and severity of Parkinson’s-related symptoms differ greatly from one patient to another. PD itself is not a fatal disease, but complications of movement problems and decreased thinking can affect life expectancy. In general, younger patients evolve more slowly and have a tendency to develop non-motor symptoms, especially thinking problems, much later in the disease course compared to more elderly patients. Many patients, particularly those who do not experience the more troublesome non-motor symptoms, can continue to work and function almost normally for many years with treatment.